However, the rapid rise of complex cloud services and data center outsourcing services is leaving many IT leaders scrambling to keep up. With that in mind, let's revisit the ideas behind the data center without walls and explore how software-defined WAN solutions empower companies. In 2012, Wired published a report discussing the emergence of the data center without walls. Initially, the news source explained, virtualization was the catalyst behind the change. Businesses that could virtualize their servers needed to have a large number of small data centers spread across branch offices. Yet at the time, companies were consolidating their data centers into single, centralized facilities. Effectively, a configuration that was once spread out among a variety of traditional, walled-in data centers, was now moving toward a few large-scale environments. Now, however, the emergence of public cloud services began to change expectations. At the time, Wired dubbed cloud services as being largely built around basic application or infrastructure solutions, but either way, the utility of such solutions drove businesses to break down the traditional boundaries of their data centers and begin moving into the cloud. The data center without walls was born. SD-WAN solutions are becoming essential. While businesses were consolidating their data centers, they were still maintaining multiple facilities for resiliency purposes, the report explained. All of a sudden, many businesses were in a situation where they were straddling multiple major data centers alongside a variety of cloud solutions spread over multiple service providers. All of this was made possible with network systems, particularly the Internet as a connecting fabric. Wired declared that businesses responding to this new data center without walls needed to ramp up their network capabilities to support new data traffic patterns and keep business running smoothly. Fast forward five years, and we're looking at an extremely similar situation. The data center without walls is a reality, but in some ways, it looks a lot like the old, decentralized architecture many businesses were using in the early 2000s. Instead of running a wide range of disparate data centers, businesses are employing a diverse array of cloud solutions, managing a large number of vendor partnerships and trying to serve as broker, manager and support team across hybridized IT environments. The complexity is overwhelming and more companies are implementing single-source cloud systems as a result. Enter a company like Fusion. Single-source cloud ecosystems are rising in response to the growing challenge of managing a diverse range of cloud services. A single-source cloud interconnects a variety of application, infrastructure and platform services under a common ecosystem, allowing businesses to consolidate the solutions they rely on and eliminate overhead. Consolidation fueled the data center without walls movement in 2012, and the same thing is happening now as more companies work to unify and consolidate their cloud systems. Network upgrades were the key to success in the past, and they are once again essential as companies work to adjust their architectures around shifting, borderless data center setups. In particular, SD-WAN technologies are setting a foundation for success. SD-WAN solutions are becoming essential as single-source clouds break down the barriers between diverse services and businesses become reliant on technologies that simplify management. 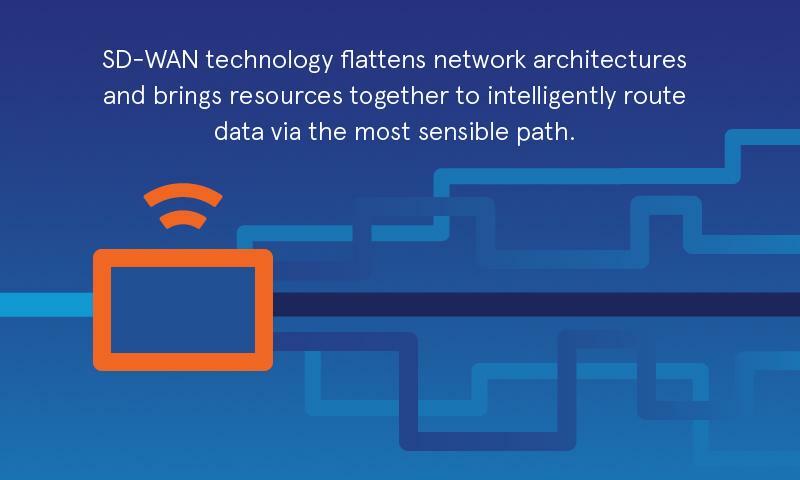 SD-WAN technology flattens network architectures and brings resources together to intelligently route data over the most sensible path possible based on a variety of characteristics. The technology renders the network practically invisible to attackers by abstracting data transit from actual hardware, making it much more difficult to target information in transit via the web. This may sound too good to be true, but it isn't. IDC found that, despite SD-WAN solutions being relatively new to the market, they solve so many key problems for today's businesses that the market is set to expand at a compound annual growth rate of almost 70 percent between now and 2021. The data center without walls movement has burst to the point that companies now have IT configurations without any boundaries. This doesn't have to be overwhelming. Fusion offers the combination of SD WAN services and single-source cloud architectures that organizations need to keep their various technology systems under control.